Personalized with your 3 letter monogram ! No names, Mrs. or phrases are included in this listing. This sale is for the Natural Plain Hat ONLY - color block hats are listed in my Etsy Shop. "Names and Bride" Monograms are listed in separate listings in my shop. Custom Hat Band and Bows Included. In stock are black, navy, white, teal, robins egg blue, red, lavender or hot pink ribbons. I have other colors, but some are a special order. If ordering other colors, please send convo for stock available. Hats with large, lush flowers are also listed in my Etsy Shop! (not included in this sale). Please note: This hat does not include flowers, tulle or specialty bride items. You may find the listing for that hat in my Etsy Shop. 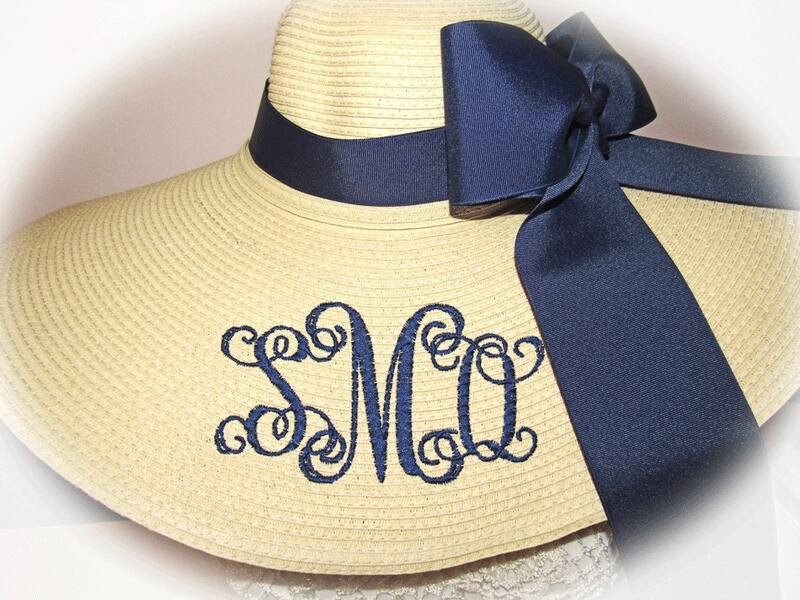 Each monogram is custom designed with coordinating hat band and bow. Hat Band and Bow are removable and/or can be repositioned. Monitors may show different colors, but this is a natural straw color hat. Shipping by Priority mail only with confirmation :) We ship to verified addresses only unless other arrangements are approved prior to shipping and purchase. If your paypal address and account is not verified and confirmed through paypal, you must do so before ordering or we cannot ship.